I installed Aerosoft's EGLL (incl. update 1.01). The using the SIMSTARTER I actualized the airports...... 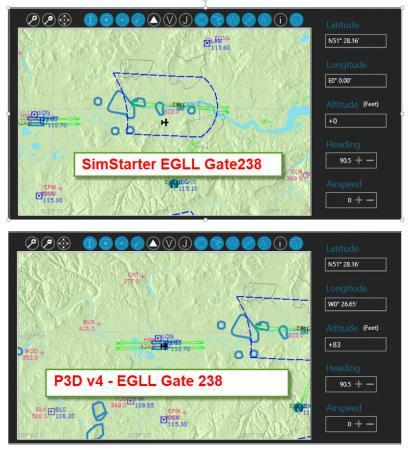 In SIMSTARTER I then selected Gate 238 as the starting position but after P3D v4 opened I was somewhere in the countryside. But using P3D v4 to select the location the result was much better e. g. I found myself at the Gate 237 ..... Any Ideas what to do? The problems with gate numbers are based on wrong "display boards" at gates 238 and 239 in EGLL - the boards show instead 237 and 238. I already informed Aerosoft in another thread. and the Longitude value is correct. The problem is with SimStarter that it cannot read a negative value in G5.csv as after changing the value to 0.444166 it was was correctly displayed instead of E0" 0.00' ......! Thank you for your big effort solving this out. You are 100% right. Confirmed bug of SIMstarter NG. Will be fixed with next update.